1 Season chicken, if desired, with salt and pepper. Combine Hellmann's® or Best Foods® Real Mayonnaise, vinegar and chicken in a large, shallow nonaluminum baking dish or resealable plastic bag. Cover, or close bag, and marinate in refrigerator, turning occasionally, 1 hour. Remove chicken from marinade, discarding marinade. 2 Preheat oven to 425°. 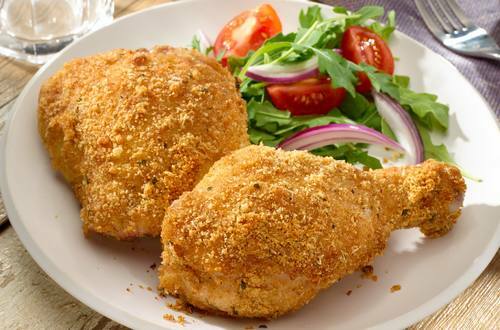 3 Combine bread crumbs and cheese in shallow dish; coat chicken with mixture. 4 Arrange chicken on ungreased baking sheet. Bake 35 minutes or until chicken is thoroughly cooked. TIP:  Great  with a Dijon dipping sauce or a creamy bruschetta topping. For a Dijon dipping sauce:  combine 1/4 cup Hellmann's® Real Mayonnaise with 2 Tbsp. milk and 1 tsp. Dijon mustard. For a creamy balsamic  bruschetta topping: combine 1/4 cup Hellmann's® Real Mayonnaise with 1 cup seeded and chopped tomato, 2 Tbsp. chopped red onion, 1 Tbsp. thinly sliced fresh basil leaves and 1 tsp. balsamic vinegar.